My apologies, the logic is solid. Our view is different than your view. Clockwerk, Malt is also banned, yet his profile doesn't state this explicitly. This is only visible for the mods and admins. It's a spam breeding ground because you said you'd delete it so we made the most of the situation and made assses of ourselves. His profile might show he was on if he altered his cookies, it's happened before with others who were banned trying to sneak back on. 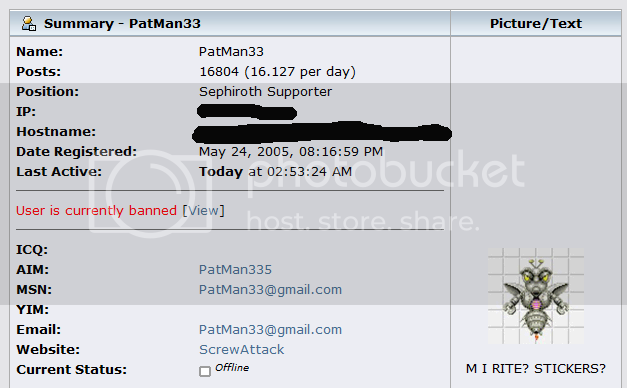 It's happened before, they managed to view the forum briefly before being kicked. I think what you saw is an attempt of his to get back on at that time. Wow, didn't know he got banned too . New screen shot, same time as you but same message. He obviously tried to sneak back. If he had made it I'm sure he would have posted something. Anyone can alter a picture, I demand evidence in the form of PMs and Emails that were sent and received. Nothing gets past Ladym eh. Sorry but emails and pm's are private. We've already shared more information than we ever have before. If you want to think it's altered, fine. Wow. That was funny. Longtime member gone, on the perfect day. You know, this summer I'm going to write the Epic of Patman. Does anybody really believe this?. I don't, It was a nice try though.